Editor’s Note: This article was compiled from press materials provided by the American Roentgen Ray Society media relations department at the society’s annual meeting in May. Low-dose whole-body CT is nearly four times better than radiographic skeletal survey for determining the extent of disease in patients with multiple myeloma, according to a new study conducted at the University of Maryland in Baltimore. The study included 51 patients who had both a radiographic skeletal survey and a low-dose whole-body CT examination. The total number of lesions detected in these patients with low-dose whole-body CT was 968 vs. 248 detected by radiographic skeletal survey. Low-dose whole-body CT was significantly better than radiographic skeletal survey in detecting lesions in the spine, ribs, sternum, and flat bones, Princewill added. The use of low-dose whole-body CT is accepted in Europe as an accurate alternative to radiographic skeletal survey for detecting bone lesions in these patients, Princewill said. A concern about radiation dose may be one reason why it is not widely accepted in the United States, he added. “Our study employed a low-dose protocol, with an average recorded CT dose of 4.1 mSv. That compares to 1.8 mSv for the radiographic skeletal survey. Using modified protocols and exposure parameters, we were able to significantly reduce the radiation doses to our patients without significantly compromising the image quality required to detect myeloma lesions. The average CT dose used in our study was approximately nine times lower than doses used in the acquisition of standard body CT studies,” Princewill said. Cervical spine CT examinations are unnecessary for emergency department (ED) patients who are victims of simple assault or who have a ground-level fall unless the patient has a condition that predisposes him or her to spine fracture, a new study conducted at Grady Memorial Hospital in Atlanta found. Researchers from the department of radiology and imaging sciences of Emory University School of Medicine in Atlanta found that out of 218 exams for simple assault, none were positive, said Andrew Nicholson, MD, lead study author. In the series of 154 cervical spine CT scans that were obtained for ground-level falls, there was only one positive exam. This fracture was in a patient with ankylosing spondylitis, a condition known to increase the risk of spine fracture. Cone-beam CT is superior to mutidetector CT for finding superior semicircular canal dehiscence, or the so-called third window in the inner ear bone, that can cause dizziness and hearing loss, and it uses one-half of the radiation dose, according to a study done in Bruges, Belgium. The study included 21 patients who had both a cone-beam CT and a multidetector CT examination of their right and left temporal bones, said David Volders, MD, one of the study authors. Two radiologists reviewed the images from both exams and scored them based on image quality and the presence of pathology. “[Cone-beam CT] corrected a false-positive diagnosis for superior semicircular canal dehiscence in 11 out of 16 cases which were positive on multidetector CT (68.8%),” Volders said. Multidetector CT had indicated there was a dehiscence of the superior semicircular canal when there wasn’t, he said. In addition, cone-beam CT scored significantly better than multidetector CT in visualizing normal temporal bone anatomy, Volders added. Contrary to current guidelines, women with benign breast biopsies do not need follow-up at six months; in fact, they may not need close surveillance at all, new research shows. The research, conducted at Moffitt Cancer Center in Tampa, Florida, followed 388 patients for six, 12, and 24 months. Reed said an annual mammogram, as part of regular preventive care, could replace the need for benign breast disease follow-up for these patients. Close surveillance over the two-year time period led to more than 6% of these women having an additional biopsy performed, all of which were benign. This suggests overmanagement and overtreatment of these patients. Avoiding that would reduce radiation exposure to patients and save healthcare costs. Radiologists and nuclear medicine physicians recommended additional imaging about 30% of the time in oncologic PET/CT reports, with about one-half of those recommendations considered unnecessary, a new study shows. The study, conducted at Brigham and Women’s Hospital in Boston, included 250 patients and found there were 84 recommendations made for additional imaging. When study reviewers examined the patients’ records, they concluded that 43 of those recommendations were unnecessary, said Atul Shinagare, MD, one of the study authors. No adverse patient outcomes would have occurred by not recommending additional imaging tests in these 43 cases, Shinagare said. Although the study did not specifically address the motivating factors behind the recommendations for additional imaging, the authors expressed some of their thoughts on the motivation. 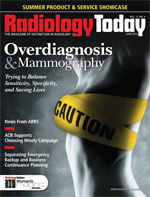 “We feel that some of the most important factors leading to unnecessary recommendations include reluctance of physicians to accept uncertainty regarding diagnosis, partly driven by legal liability concerns, combined with a failure to fully consider the patients’ clinical circumstances and the likely cost-effectiveness of additional imaging tests,” Shinagare said. Using a decision-support system to order chest CT exams translates into positive examinations 76% of the time, according to research from Massachusetts General Hospital in Boston. The research involved reviewing 93,818 chest CT exams performed with the assistance of a decision-support system. The system provides a utility score for the test being ordered. When faced with low utility scores, referring physicians may choose to modify their imaging request, cancel the examination, order a different type of examination, or proceed with the order. The study found that only 12% of the examinations with a low utility score translated into a positive finding compared with 87% for those with a high utility score, according to Supriya Gupta, MD, a study author. “Rising concerns about radiation risks, imaging growth, and reimbursement costs has highlighted inappropriate imaging use,” Gupta said. The study also reviewed utilization, which was highest when abnormal chest radiography, shortness of breath, or persistent cough was listed as the indication for performing chest CT, Gupta said. Contrary to common belief, patients with a history of diabetes do not have the highest risk of contrast-induced nephrotoxicity, according to research from Northwestern Memorial Hospital-Northwestern University in Chicago. Instead, the study found that patients with a history of renal disease, hypertension, and/or heart disease are at greater risk of the condition. The study included 2,404 patients who underwent an eGFR test immediately before undergoing a CT examination. The study found that patients had a significantly higher risk of abnormal eGFR if they had renal disease, hypertension, or heart disease but not diabetes, he said. Many facilities use surveys to help identify patients at risk of contrast-induced nephropathy, Yaghmai said. Based on those results, patients most at risk undergo a test to measure their renal function. Newly diagnosed breast cancer patients should undergo a preoperative MRI exam even if their breasts are not dense, a new study indicates. The study found no difference between the usefulness of 3T breast MRI in detecting additional malignancies and high-risk lesions in dense vs. nondense breasts. “There are currently no guidelines that define the role of breast density in determining if a preoperative MRI should be performed. However, anecdotally, we know that preoperative MRI exams tend to be ordered more frequently in younger patients and/or patients with dense breast tissue,” said Reena Vashi, MD, one of the study authors. The study of 127 patients, conducted at Yale University School of Medicine, found that 3T MRI detected additional malignancies in 26% of patients who had breasts that were not considered dense and in 25% of patients with dense breasts, Vashi said. There was no difference in the patients with dense breasts compared with those without dense breasts in regard to the size of lesions detected or their distribution in the study. In both populations, a significant and statistically similar percentage of patients had unsuspected additional cancers in the opposite breast or a separate quadrant from the known cancer in the same breast, necessitating a change in surgical management.